8th Illinois Cavalry Letter in Reaction to Lincoln's Death - "The general reaction in this heart of the army is that of revenge." 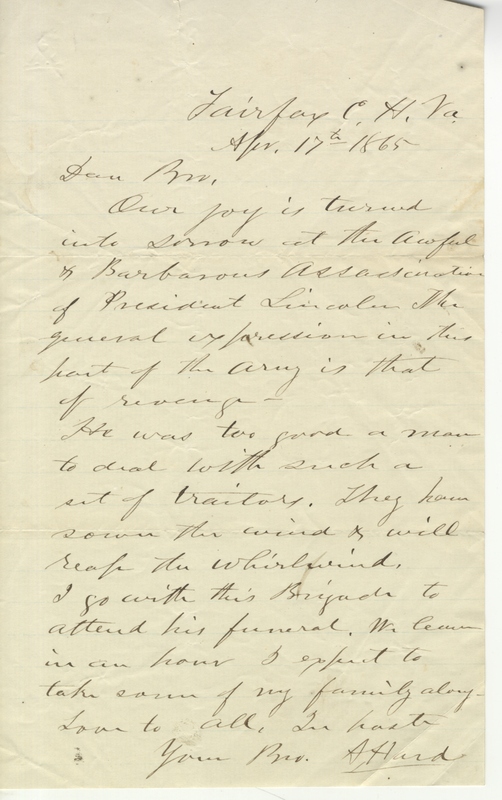 Letter from Dr. Abner Hard, a doctor in the 8th Illinois Cavalry, describing his reaction to the Lincoln assassination. Our joy is turned into sorrow at the awful and barbarous assassination of President Lincoln. The general reaction in this heart of the army is that of revenge. He was too good a man to deal with such a set of traitors. They have sown the wind and will reap the whirlwind. I go with this Brigade to attend his funeral. We leave in an hour. I expect to take some of my family along. Love to you all, in health. Milwaukee County Historical Society, Hard Family Collection.